The new flagship was not designed as TITAN replacement, it will serve a different purpose, which is strictly gaming-oriented. TITAN is still better for CUDA developers, researches or scientists, since it provides good double-precision performance and 6GB frame buffer. The GTX 780 Ti on the other hand, will (for now) only ship with 3GB memory. Official document does not mention any 6GB or 12GB variants. NVIDIA GeForce GTX 780 Ti is equipped with 2880 CUDA cores. The most interesting part is that GTX 780 Ti still has high number of 64-bit CUDA cores (960), this is even more than GTX TITAN. So it seems that the only benefit of having a TITAN right now is 6GB frame buffer. GTX 780 Ti is using GK110 GPU with 5 Graphics Processing Clusters, 15 Streaming Multiprocessors, 2880 FP32 CUDA cores, 960 FP64 CUDA cores, 240 Texture Mapping Units and and 48 Raster Operating Units. Card is equipped with 3GB GDDR5 memory clocked at 7 GHz, across 384-bit interface. This equals to 336 GB/s bandwidth (16GB/s more than R9 290X). 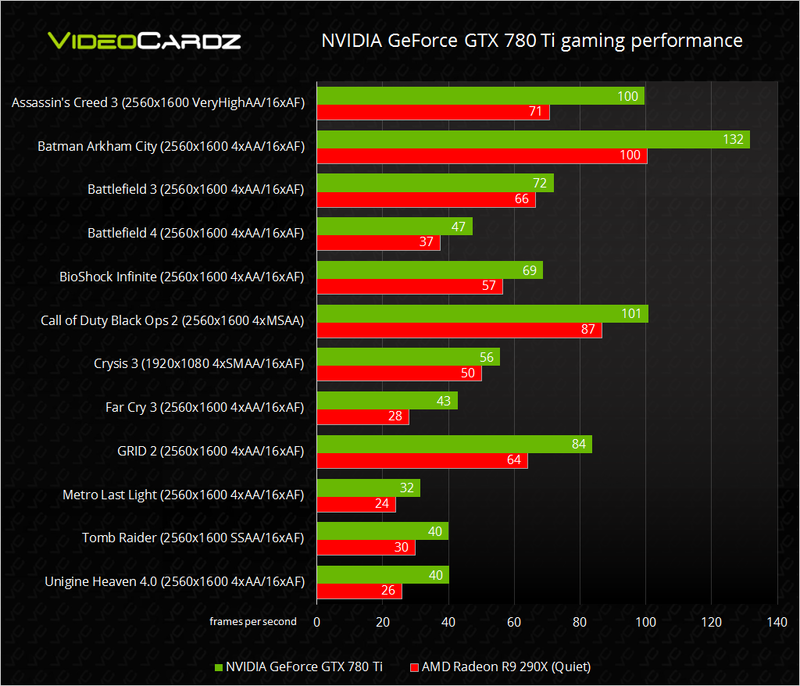 The GTX 780 Ti has higher base clock, although AMD does not officially confirm 800 MHz clock for 290X. On the other hand 780 Ti has lower boost clock (928 MHz vs 1000 MHz), but AMD is using peak performance clock, which is far from real-world scenario. Moving on to power characteristics. GTX 780 Ti has much lower TDP than 290X, which is 250 watts. This is actually the same number as for TITAN and 780. NVIDIA already announced that their newest, and fastest graphics card will be available for $699, which is obviously much more than R9 290X’s launch price ($549), but also much less than TITAN’s ($999). Official document does not mention any special edition of the card. 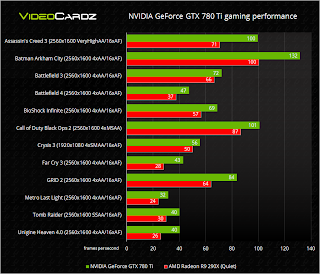 According to the official data NVIDIA GeForce GTX 780 Ti would perform 30% better than 290X. Of course we are looking at the numbers from NVIDIA, so it’s necessary to take these numbers with a grain of salt. I was told that in ‘real’ benchmarks GeForce GTX 780 Ti is about 20% faster than 290X in Quiet Mode. In Uber Mode R9 290X is still slower than 780 Ti, but only by 13%. If we add 4k benchmarks this number will get even better in AMD favor.